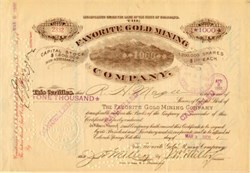 Beautifully engraved certificate from the Favorite Gold Mining Company issued no later than 1902. This historic document has an ornate border around it with a vignette of a snow capped mountain peak. This item is hand signed by the Company's officers and is over 115 years old. The Favorite Gold Mining Company was incorporated in 1894 under the Laws of the State of Colorado. The mines were located in Teller County, Cripple Creek, CO.